Get your copy of The Oily Pet! Are you confused about whether essential oils can be safe to use with and around your pets? I was too, until I did the research. I am an internationally-recognized animal protection attorney and former prosecuting attorney (I am not a veterinarian). But I have spent 6 years studying the chemistry and effects of essential oils and how they can be safely used with pets. After years of using essential oils to help pets, shelter pets, and abused/neglected animals, I share my experiences. 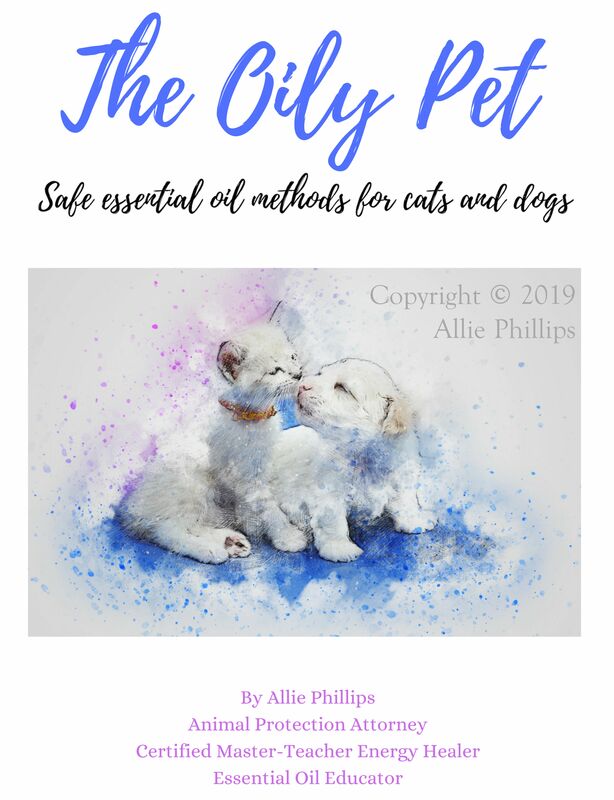 In teaching numerous classes on safely using essential oils with pets and finding a lot of confusing, incomplete and inaccurate information on the Internet, I decided to publish what has worked for me, my cats, shelter pets I work with, and my pet clients. This is an easy-to-read 24-page booklet that will help you identify and reduce toxins in your pet’s environment, how to identify pet-safe essential oils, how/when/where to safely use essential oils with pets, how to safely use oils with your cat, and a listing of essential oils that pets love. And a big thank you to Dr. Susan Albright DVM for peer-reviewing the booklet and writing a Foreward from the perspective of a veterinarian! Or email me for a custom order and price or if you live outside the U.S.
How many booklets can I send you? Tell me what you think about the booklet … leave a reply below! I was so excited to receive my copy of The Oily Pet last week. It is an easy read, concise, and packed full of information. 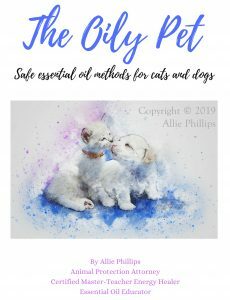 I read it cover to cover in a small space of time Allie debunks a ton of myths about utilizing essential oils in our pets daily lives. There’s plenty to learn, even by a seasoned user, like myself. Allie shares her love of animals and helps us understand how oils can enhance our pets lives. I will be recommending it to all my friends who share their lives with pets.